Several women hit the golf course last week to play a solid round of 18 holes, but also do it for the Susan G. Koman Rally for the Cure. 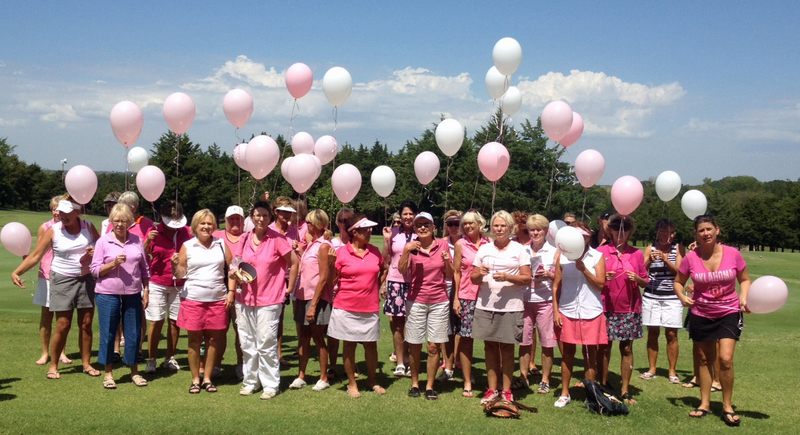 Perhaps the most emotional moment of the afternoon came when the golfers released balloons into the air as they remembered their friends and loved ones affected by breast cancer. The ladies enjoyed a delicious lunch buffet served by Kathy Sells at Masters Grill. A flight; Kathy Parrott and Nita Williams took top prize; Paula Stone and Patti Chamberlain finished second and Joyce Westbrook and Debra Hansen took third. B flight; Sharon Piscitelli and Bonnie Brewer won first; Darla Colbert and Susie Campbell took second and Leona Westbrook and Judy McNally finished third. C flight; Barbara Keim and Gail Sullivan won first, Terry Wieczorek and Jackie Nelson was second and Maggie Patterson and Jen Satterfield took third. Closest to pin winners were Marge Donoho, Jan Hixon, Peggy Momsen, Judy McNally, the Long Drive competition was won by Kathy Parrott, the Straight Drive award went to Judy Anderson and the Most Honest was won by Misti Martin and Riece Baker. One Response to "Golf tournament benefits Rally for the Cure"